October is the best month to get a clear view of the scenic beauty of Nepal and the International Youth Camp Nepal is an opportunity that the team of Youth Legend, Nepal shares to have magnificent journey with the set of phenomenal people from across the globe in the land of Nepal, heaven of earth. 10 days of the International Youth Camp with 30 dynamic people from different parts of the globe meet and get a chance to network with like-minded people and build connections along with which, the 30 energetic youth get to explore the beauty of Nepal. Every adventurer and networker between the age of 16 and 29 has the privilege to apply and the selection process takes a week’s time to ensure that the right participant gets the opportunity. Every participant gets a chance to build leadership, communication and entrepreneurial skills through varied, fun filled activities and unleash one’s inner potential while you also enjoy the nature. Unforgettable moments at the Kathmandu and Pokhara regions, where you get to visit the World Heritages, and also hike to the Monastery at the top of the Mountain, Peace Stupa, Pokhara. Along with the exercises and Meditation in the morning, one gets a chance to develop his/her skills through the Leadership, Team Building and Communication Workshops. Dance Movement Therapy (DMT) is an addition to achieve greater self-awareness, a positive sense of well-being and heal from past life stress. A chance to interact and network with the influential people of Nepal and get mentored from experts of different domains are the add-ons. A nominal cost of 700 US Dollars and 10 days of yours can be the best investment in yourself. Apart from the participation, the fee also covers travel insurance upto 50,000 US Dollars, food, accommodation, pickup from the airport and drop to the airport, local transportation costs and entrance fee at the heritage sites, t-shirt for very participant, program tool kits, internet facilities to stay connected. An individual also gets an official certification for one’s participation. 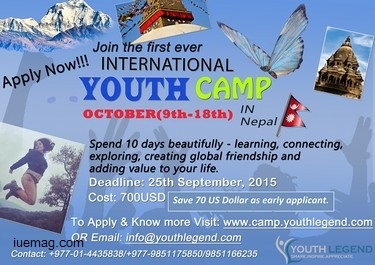 http://www.camp.youthlegend.com/international-youth-camp-nepal-october-2015/ for the prodigious International Youth Camp to explore yourself and the nature, build networks and make collaborations. You could also connect to the organizers at info@youthlegend.com. Happy Journey to the “roof of the world”! Any facts, figures or references stated here are made by the author & don't reflect the endorsement of iU at all times unless otherwise drafted by official staff at iU. This article was first published here on 23rd September 2015.